Tobacco smoking seriously affects internal organs, particularly the heart and lungs, but it also affects a person’s appearance. While these changes are generally not as life threatening as heart and lung disease, they can, nevertheless, increase the risk of more serious disorders and have a noticeable ageing effect on the face and body. Research shows that the more a person smokes, the greater the risk of premature wrinkling. Skin damaged by smoke has a greyish, wasted appearance. Skin can be damaged by tobacco smoke in several ways. Firstly, tobacco smoke released into the environment dries the skin’s surface. Secondly, smoking reduces the amount of blood flowing to the skin by constricting blood vessels, thus depleting the skin of oxygen and essential nutrients. Research has shown that the skin-ageing effects of smoking may be due to increased production of an enzyme that breaks down collagen in the skin and causes it to sag. Collagen is the main structural protein of the skin which maintains elasticity. Over time, as collagen is reduced, squinting in response to the irritating nature of the smoke and the puckering of the mouth when drawing on a cigarette causes wrinkling around the eyes (known as Crow’s feet) and mouth. Smokers in their 40s often have as many facial wrinkles as non-smokers in their 60s. Skin damage caused by smoking may not be immediately visible to the naked eye, but is still happening, and can start to be detected in one’s 20s or 30s. In addition, smokers may develop hollow cheeks through repeated sucking on cigarettes: this is particularly noticeable in under-weight smokers and can cause smokers to look gaunt. All these changes add up to what some doctors describe clinically as a “smoker’s face”. This explains why it is often easy to identify a smoker just by looking at their face. Smoking impairs wound healing, delaying recovery and increasing complications. Although this occurs with all types of surgery, some plastic surgeons have been known to decline to perform cosmetic surgeries on patients who refuse to quit smoking. The Royal College of Anaesthetists states that quitting smoking any time prior to surgery is beneficial. Psoriasis is a chronic inflammatory skin condition which, while not life-threatening, can be extremely uncomfortable and disfiguring. Compared with non-smokers, smokers have a two- to threefold higher risk of developing psoriasis, with women being at the greatest risk. 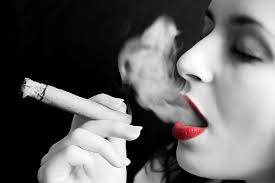 ~ Complexion: Smoking can make people more prone to acne and delay the healing of blemishes. Women, in particular, have been found to have more frequent and severe acne, which worsens the more they smoke. Smoking is also considered a trigger for acne inversa, a chronic inflammatory skin disease that can be quite disfiguring. ~ Hair: Smoking reduces the nutrients that reach hair, leaving it lacklustre. Smoking may even discolour hair, particularly facial hair in men. Researchers have also found a link between smoking and accelerated hair loss and greying. ~ Eye appearance: Smoke can damage eye blood vessels creating a bloodshot appearance and causing irritation. ~ Hands: Prolonged smoking causes discoloration of the fingers and fingernails on the hand used to hold cigarettes. ~ Cancer: Cancer of the lip, tongue, gums, etc. can cause severe disfiguration.